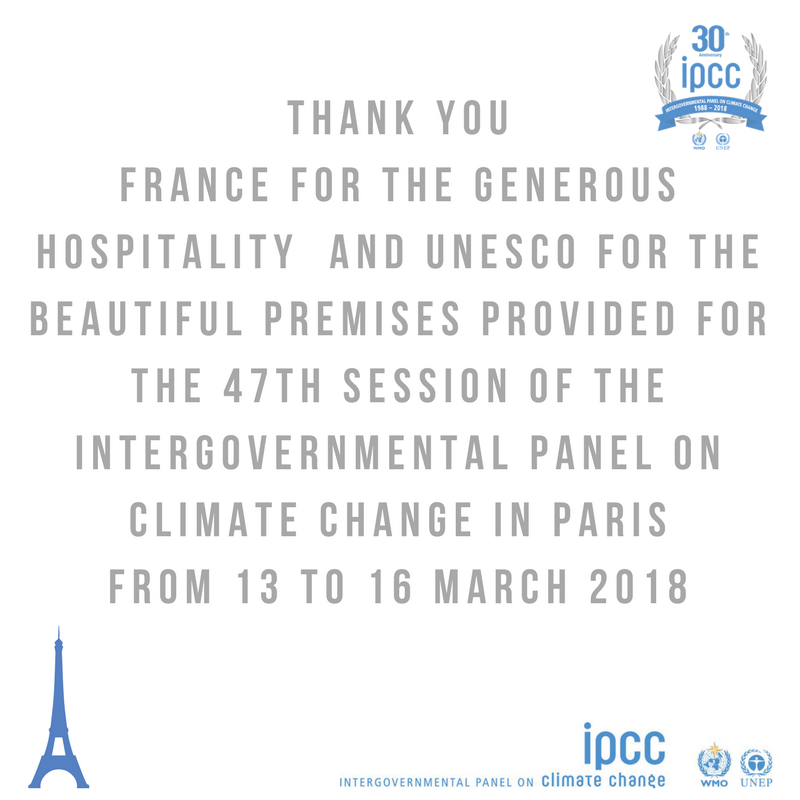 For four days this week, March 13 – 16, the IPCC has been congratulating itself on its 30th birthday, in a lavish celebration in Paris. Apparently the premises were beautiful and the hospitality generous. A number of deep scientific insights were provided at the meeting, such as “We must put climate solutions in the context of sustainable development” from the IPCC Chair Hoesung Lee. You can read his speech here if you really want to. Quite how they managed to make the birthday party last four days isn’t clear. And just a week before that, here he is again, this time in Bologna (why are IPCC meetings never held in Birmingham?) at a meeting called “All4theGreen”. The slogan for this one was “mobilizing climate science”. I can’t help wondering how much all this costs, who is paying for it, and what its carbon footprint is. Tags: IPCC, news, propaganda. Bookmark the permalink. Previous post ← Do Cook and Lewandowsky have blood on their hands? Oh relax for Fox ache. The several kilometres (stacked vertically) of reports the IPCC produces, and the ante hoc Reader’s Pre-digests thereof, represent more than enough carbon capture. And all the flights are neutral, assuming the delegates go back whence they came. This article is alarmism of the most innumerate, uninformed kind, Paul! Pure adrenalin-bait for the cortisol junkies. Next you’ll be accusing the world’s most pro-planet intergovernmental panel of throwing itself a Dirty Thirty party! Climate change needs to be assessed in the context of sustainable development, and this consideration should pervade the entire report across the three Working Groups. In past assessments sustainable development and its various linkages with climate change were seen largely as an add-on. Most governments who have commented on this issue have highlighted the need to treat sustainable development as an overarching framework in the context of both adaptation and mitigation. The next meeting is in October in Korea “ in good time for the facilitative dialogue at COP24 next year.” To be fair, the next COP meeting is in Katowice, Poland, which looks a lot like Birmingham. San Jose was rated as the most stainable city in the US. I couldn’t find ANY cost information to support the “Affordable and Clean Energy” goal in the ratings matrix that SJ won. Is real, its threats will increase and we have the means to stop it cost-effectively”. Has anyone found a definition of what he means by “we have the means to stop it cost-effectively”? Its a gig. But methinks the US funding music for it is about to stop. Trump will be trashed yet again as a party pooper. Deplorable! pass on the costs to us. “Its a gig. But methinks the US funding music for it is about to stop. Trump will be trashed yet again as a party pooper. Deplorable!” Perhaps the Exon lawyers in California will insist that NASA Giss explain how their Computer Models may have any relevance; when they cannot define “temperature” nor planetary “atmosphere”, let alone some possible relationship between the two! NYC Goddard (radiative BS) will become a historical embarrassment, and NOAA can go back to the careful compressible fluid dynamics analysis. Beth, I bet they do that already. Remember, they’re not doing all that partying for themselves, it’s for all of us. No bar bill too big, no personal sacrifice too small, to save the planet. An “l” appears to have slipped from my name (thus ALAN KENDAL) to the end of my 16 Mar 18 at 6:31 post, which as a result gained an unwanted “Your comment is awaiting moderation.” The unmitigated shame!! Why is Alan Kendal (whoever he is) so shunned? LO, it’s more that Alan KendaLL is on the good boy’s list, or more specifically on the regulars’ list. Or is it LOL with a slipped L? Appropriately the 30th anniversary stone is a pearl, composed of calcium CARBONate around an irritant, and the anniversary colour is GREEN. LO as in LO, FUNEX? S VFX. FUNEM? S VFM. OK MNX41. More fake academic BS! The written word is the attempted explanation of why some measurement is not that expected! Your definition is but some trivial chit-chat of no import! Dear oh dear. Are you arguing for arguing’s sake Will? “More fake academic BS”. Somewhat offensive and definitely ambiguous. Is is fake BS or fake academic? Difficult to believe that anyone would argue that writing wasn’t for communication, but there you go! “The written word is the attempted explanation of why some measurement is not that expected”.Really? Care to tell me what measurement tiny had made that was unexpected (other than his estimation of my ability to decipher his wisdom)? “Your definition is but some trivial chit-chat of no import!” More unwarrented offensiveness. I was not aware that I had made any definition. I would only concur that my post was of no import. ..”Meanwhile, fellow sufferers from truth decay and climate sensitivity will be pleased to learn a remedy is now available. You can purchase the new Mann-endorsed toothpaste online from The Climate Store. tiny. Will retreat with head aloft. As a consequence you shall be overwhelmed with likes.